Hundreds of people will be sleeping outdoors tonight (Saturday) in Des Moines to raise awareness and money to address the problem of youth homelessness. 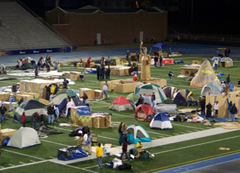 The fourth annual Reggie’s Sleepout takes place on the football field at Drake Stadium. Jim McSweeny, Resources Coordinator with Iowa Homeless Youth Centers, says the activities begin at 3 p.m. with live music, food and games. “Then, after midnight or whenever, we’ll all climb crawl in our (cardboard) box and sleeping bag and experience a little bit of what it must be like to be an unsheltered homeless person,” McSweeny said. Participants collect pledges and donate nonperishable goods for local food pantries. McSweeny is expecting a solid turnout tonight. Last year’s event drew around 800 people. McSweeny is hoping 1,000 people will take part in Reggie’s Sleepout this year. The event is named for Reggie Kelsey, a young man who aged out of the foster care system in 2001 and within three and a half months, was found dead in the Des Moines River. Last year’s sleepout raised more than $150,000. All proceeds from the event benefit the Des Moines Area Religious Council and Iowa Homeless Youth Centers. McSweeny says his organization works to identify homeless youth in Des Moines and “help equip them to become self-sufficient adults.” The Des Moines Area Religious Council operates nine food pantries in the metro area.